Although lead has been banned from paint and gasoline for several decades, the toxic metal still lingers in many backyards in New York and New Jersey. From the soil it can then find its way into people’s homes and children’s mouths. Lead is particularly bad for kids under the age of 6. It disrupts growth in young brains, increasing a child’s risk of developing a low I.Q., attention deficit hyperactivity disorder, and behavioral problems. The first step toward protecting yourself and your family from lead poisoning is to know whether and where the risks lie. That’s why a new exhibit at Columbia’s Lamont-Doherty Open House will be testing soil samples for lead levels. On October 13, Open House attendees can bring in soil samples from their yards and local parks for testing. The test only takes a few minutes and it’s totally free, as is Open House (although donations are suggested). 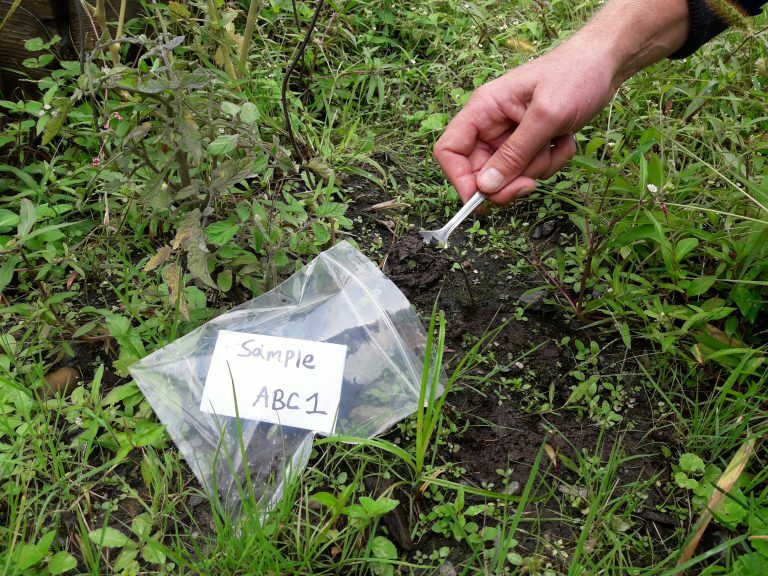 To collect the samples, use a spoon to scrape off the top few inches of soil and scoop it into a small Ziploc-style plastic bag. Sort the samples according how the soil is used, with one bag for three different types of areas: 1) areas where kids play on exposed soil; 2) areas where you’re growing food, if applicable; and 3) an area that you suspect might be contaminated, such as near your house or a shed that used to be painted. New soil that has been brought in for landscaping or gardening purposes should be stored in a separate bag. Label each bag with a marker, or by slipping a paper label inside. Attendees can bring a maximum of three samples per household. The soil tests will be led by Lamont research professor Lex van Geen and students from Columbia University and Barnard College. Their team has been studying lead levels in Brooklyn backyards and they hope to soon expand to other neighborhoods. If you’d like your soil samples to contribute to their research, click on this link from your phone while you’re collecting samples. The site will use your phone’s GPS to show the researchers exactly where the soil sample is collected. To respect your privacy, the site lets you choose how much information you’d like to share regarding your location. What if There’s a Lot of Lead in My Soil? The Environmental Protection Agency sets 400 parts per million as an acceptable level of lead in bare residential soil. However, the team’s research so far suggests that many backyards exceed that level. For participants concerned about their results, the researchers will have resources on hand with answers to frequently asked questions and advice for further testing. The best way to deal with lead-contaminated soil is to cover it up, since excavating it can kick up more dust and increase your exposure. Landscaping fabric covered with new soil is a very good option. Less expensive alternatives include bringing in mulch or gravel, or planting grass to prevent the soil from blowing around or getting tracked indoors. Backyard gardeners can grow food in pots or raised beds, and parents should make sure children are not playing in exposed soil in contaminated yards—try installing a sandbox instead. Van Geen will present more information about lead exposure in New York and New Jersey during a lecture at 1:30pm during Open House. More details are available here.